Houses & Homes VA: These Gingerbread Cookies Are So Good They'll Make Grandma Jealous! These Gingerbread Cookies Are So Good They'll Make Grandma Jealous! 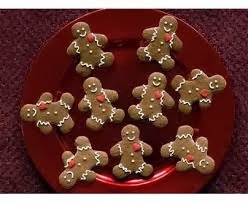 No Christmas would be complete without some tasty gingerbread cookies to eat, right? Well I’m going to break all the rules this year and share my top secret recipe for this great seasonal snack! It’s easy to do and they taste AWESOME - Enjoy! Preheat oven to 375 deg. Line the oven directly with parchment paper (also known as “baking paper”). You can also use baking pans if you prefer. Combine the flour, baking powder, baking soda, salt, ginger, cinnamon, and cloves until well blended. Using a separate large bowl beat the butter, brown sugar, and egg on medium speed until well blended and then add the vanilla lemon zest and molasses and complete mixing it all together. Once this is done slowly add the dry ingredients that you mixed first. Now your dough is ready to go! Divide the dough into 2 halves and wrap it with plastic wrap. It will need to stay at room temperature for at least 2 hours but overnight is much better. Try not to exceed 8 hours to maintain the best consistency. To begin baking you will need to take 1 of the dough and roll it out on a lightly floured surface. A table or counter top is just fine and be sure to sprinkle a little flour over the dough as well. You’ll want to roll it out until it’s about ¼” thick and it’s time to get out your favorite cookie cutter! You can make any shapes you like but I think that the gingerbread man is the best! Make sure that you have about 1 ½” of space between the cookies when you place them on the cooking sheets. Each oven is a little bit different but 7 minutes is usually enough if you like soft cookies and 10 minutes will make them crunchy. I like to make them both ways. After they cool you make decorate them any way you wish. A powdered sugar glaze is good and so is Royal icing. Either way they are AWESOME cookies and they’ll keep your friends and family coming back for more!